Downtown Las Vegas Pizza | We Deliver! You haven’t had pizza until you’ve had it Downtown-style. Pop in to Pop up Pizza for a taste-bud-bursting combo of fresher-than-fresh ingredients, imaginative recipes, and a delicious array of flavors from salads to beer and wine to (of course) pizza and more. Your home for Fremont Street Pizza, Vegan Pizza and even downtown Las Vegas Pizza Delivery! It’s time to stop and smell the pizza. And eat it, too! 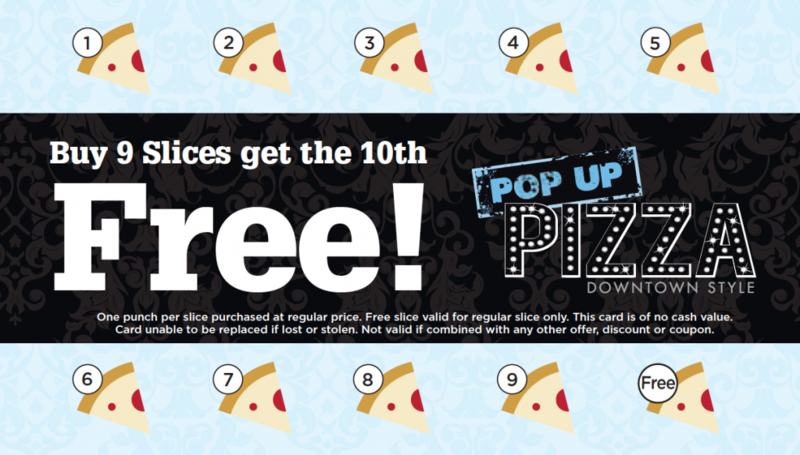 Buy 9 Slices and Get the 10th Free! Located in the beautiful Plaza Hotel, Pop up Pizza is a delicious addition to Downtown Las Vegas. Pop Up Pizza has an intimate, cozy dining area and is marked by distinctive, modern decor. The food speaks for itself. Fresh ingredients, homemade tomato sauce, and perfectly baked crust make the pizza unique and unforgettable.